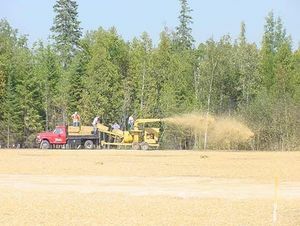 Application of mulch at a construction site. Slope properly stabilized with mulch to prevent erosion. Failed mulch application, showing significant erosion. Erosion is the process by which soil, rock, or other material is moved from one location to another, typically through the action of water or wind. 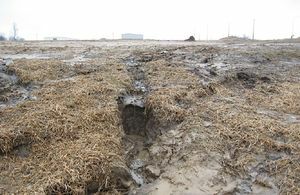 Erosion prevention practices are designed to prevent or minimize erosion. Typical erosion prevention practices involve one or more of the following. Covering bare soil with vegetation, mulch, erosion control blankets, turf reinforcement mats, gravel, rock, plastic sheeting, soil binder chemicals, etc. 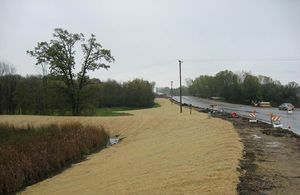 This page provides links to several pages in this manual that address erosion prevention at construction stormwater sites, as well as links to other pages and information related to erosion prevention practices. Warning: The Construction Stormwater General permit states "The Permittee(s) must stabilize all exposed soil areas (including stockpiles)." For more specific information, see Part IV.B.2 of the permit. This page was last modified on 4 April 2019, at 14:30.